Once again after a break of another two months I finally found myself back walking along the Harcamlow Way. Just like the previous stage it was a cool, bright sunny winters day (if the 7th March can be called winter) and in shady areas the ground remained frozen through the day although this time there was also a strong and extremely cold wind blowing in from the East. I had been intending to join the walking group to finish the last stage of the Vanguard Way however my car did not start until the sun had been on it for a couple of hours by which time I should have already been down at Newhaven so this walk was a convenient alternative. From Walthamstow I drove up to Duton Hill where I was able to park in a small lay-by directly opposite the point where the Harcamlow Way leaves the road, photo 1. From the road the route heads across a garden to join a path that runs alongside the River Chelmer, photo 2. 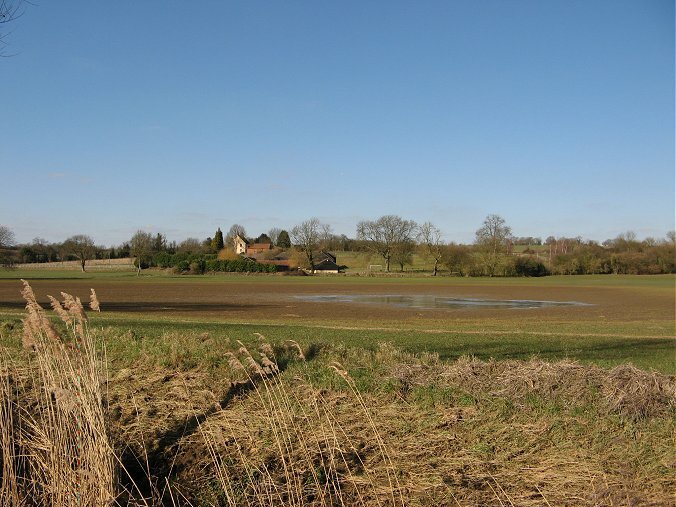 The path then follows the course of the River alongside fields and open ground for a couple of miles as the route makes its way towards the village of Thaxted. 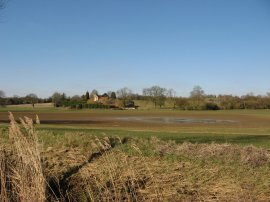 The ground around the river was reasonably dry to walk along although there was still plenty of evidence of the recent flooding in the area, photo 3, with big puddles remaining in the neighbouring fields. Reaching the B1051 the route leaves the course of the river, heading to the left along the road for a short distance before joining a footpath on the right that heads gently up hill towards the village of Thaxted. 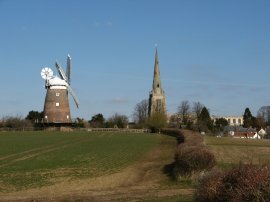 For some time the spire of the church and sails of the windmill had been visible on the horizon, photo 4, and this path headed up to the windmill. 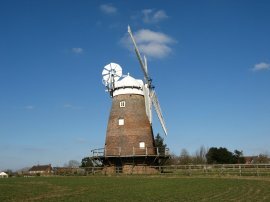 The windmill, known as John Webb's Mill was built in 1804 and has been fully restored. From the windmill it was just a short walk to join a narrow path running between houses which led up to the impressive parish church. 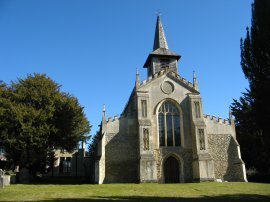 The church is 183 long and the spire 181 feet high and dominates the centre of the village. Its large size and the nearby surrounding buildings however made it very difficult to get a decent picture of the church. 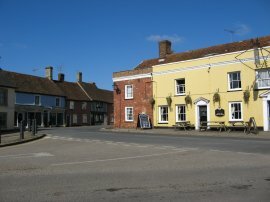 Reaching the centre of Thaxted, photo 6, I turned to my left and headed down Watling Lane which the Harcamlow Way follows out of the village. The route eventually becomes an unsurfaced track and a few hundred yards after the last house on the left I joined a bridleway on the left, photo 7, that headed out across open fields. This was not the actually the route of the Harcamlow Way however I was confused by the layout of the map. On my map the route was shown as joining a path on the left just after crossing under some electricity pylons that then gradually head slightly away to the left and I had just passed under the pylons, which can be seen to the left of photo 7, when I joined the path. 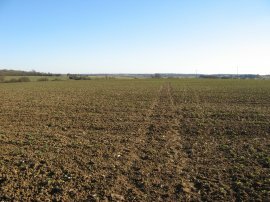 There was another path marked on the map (the one which I had actually joined) however this was shown as being before the pylons and I could not believe the pylons would be marked on the wrong place on the map so without that much thought I continued on. (I had already seen another path of to the left which I assumed was the path I was now on). However the pylons were marked in the wrong place, or have been moved since my map was printed, and are now shown more to the South on the current version of the OS Explorer Map, where they actually are. Nearing Millhill Farm I realised my mistake however could see no trace of the footpath indicated on the map that ran past the side of the house which would have been the most direct way back to the route of the Harcamlow Way so continued ahead to join a track on the right that headed down towards Woodhams Farm. 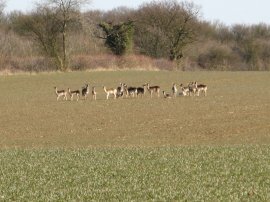 As I was heading down towards the farm I spotted herd of deer in one of the fields to the right, photo 8. As well as the electricity pylons changing location there have also been a number of footpaths in the area that have been rerouted. Joining a concrete track in front of Woodhams Farm I headed to the right to rejoin the route of the Harcamlow Way only to find a sign saying the path had been re-routed, what it didn't indicate though was in which direction. 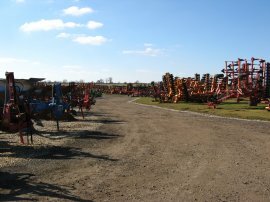 I continued down the path for some distance without seeing sign of the diversion before turning around and retracing my steps back along the concrete track right to the point where I had originally joined it where I was able to spot the new route of the Harcamlow Way path heading off into a large field, packed with all sorts of farm machinery, photo 9. 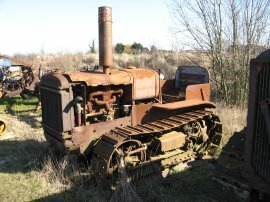 As well as the lines of modern farm machinery, which I found really interesting to look at, there were a number of older items parked besides the path as well, photo 10. The route heads up the right hand edge of the field before turning to the right at the top of the field. Reaching another hedge the route turns to the left, now heading away from the farm buildings before passing through a broad gap in the hedge on the right to rejoin the original course of the Harcamlow Way. The route follows the field edge, passing under another set of electricity pylons before heading through the hedge and crossing over the middle of an open field. Reaching the other side of this field the route turns to the left along the field boundary which is followed to Pages Farm. 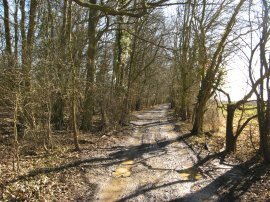 Here the route turns to the right along a tree lined byway. 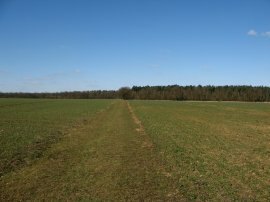 Just after the black painted buildings of Fellowes Farm the route splits into two, the Harcamlow Way heading up the left hand fork to eventually reach the path in photo 11 that runs across fields towards Rowney Wood. Reaching the wood the route joins a track running just inside the trees. 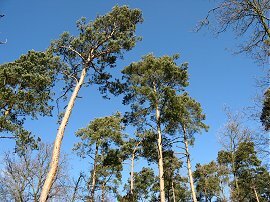 Amongst the predominantly deciduous trees there were a few tall fir trees which looked impressive against the bright blue sky, photo 12. Where the woodland extends to the left the route leaves the trees to join a field edge footpath on the left, where I stopped for my lunch break in a spot nicely sheltered from the wind, photo 13. 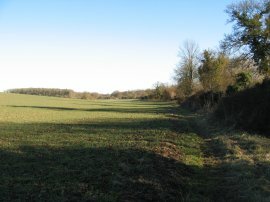 At the end of the field the path follows the edge of the woodland round to the right before joining a footpath on the left which is followed into the village of Debden, photo 14. 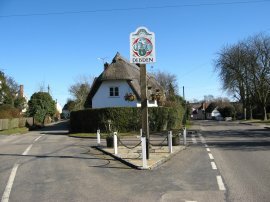 The route joins a paved road, Deynes Road, that leads down to join the High Street for a short distance before continuing on down Church Lane. At the end of the lane I reached the St Mary The Virgin & All Saints church, photo 15, where I ended my walk along the Harcamlow Way for the day. 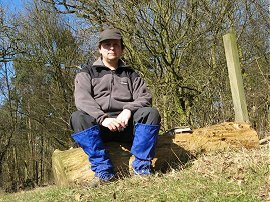 The total distance I had walked along the path was about 8 miles after excluding the extra walking nr Woodhams Farm. There is a large parking area in front of the church which will make an ideal start point for the next stage. I then set about making my way back to the car at Duton Hill. From the church I joined a footpath that headed up towards Brcoktons Plantation and continued on to Rook End Lane. 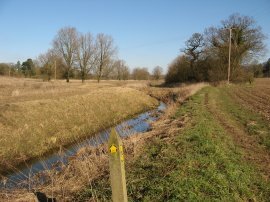 I crossed the lane by the sewage works and joined a byway, Sampson's Lane, on the other side of the road, photo 16. 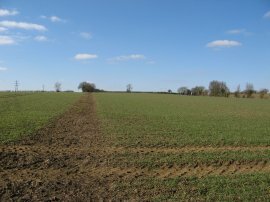 At first the surface of the byway was in quite good condition but as it headed uphill between fields the surface became muddier and muddier, eventually forcing me to cut through the hedge and walk alongside the field edges. At one point a convoy of six or seven landrovers went past, all completey covered in mud. Eventually I got fed up walking along this path and took a footpath that ran down to another byway, Green Croft Lane. it had been intention to cross over this into a small field where I could join a footpath on the other edge of the field however a deep drainage ditch meant this off path field was inaccessible and thus I had to head along the byway, although fortunately the surface on this one was is far better condition than previously. 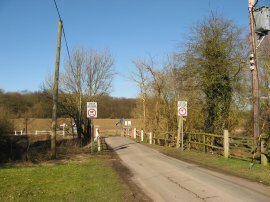 Eventually I reached Henham Road where I headed to my right along the road for a short distance before joining a footpath on the left. This path ran across one field and then along the edge of a couple more before I joined another footpath on the right that headed down towards Leggatts Farm. Passing the farm the footpath went through a number of small paddocks before heading out across fields to Cherry Green Farm.Here the path winds rounds the farm building before turning to the left along a path that leads out over Broxted Hill, photo 17, where I had a large stretch of ploughed field to cross as I made my was down to cross the Suckstead Green road. Here the path continued ahead over a rough patch of ground before heading alongside fields to Chaureth Hall farm and on down a driveway to the reach the B1051. Here I headed to the right down the road before joining a footpath on the left that ran for some distance alongside a stream towards Tilty Mill which I had passed at the end of the previous stage of my walk. At this point the sun was quite low and the hedges besides the stream were casting a long shadow across the path, photo 18. I was also walking directly into the wind and I soon started feeling quite cold. Nearing the mill I joined a path that headed diagonally to the left across a damp piece of ground towards Eseley Wood before joining another stream side path that headed up to the road and my parking place at Duton Hill. Back at the car I had walked a total distance of 15.2 miles and once again I was feeling quite tired after the last few cold miles of walking. Whilst extremely disappointed I had not been able to meet up with everyone to finish the Vanguard Way at least I had got out in the end and managed to get a decent number of miles walked.